Increasingly, we are becoming aware of the health and safety risks mould can pose for our families. In fact, the level of alarm many of us have about airborne mould, in particular, is beginning to rise to the same level of concern surrounding asbestos several decades back. That’s saying a lot! After all, once asbestos’ links to lung cancer and other respiratory diseases became widely known, there was a massive wave of asbestos removal throughout the UK. Buildings were retrofitted throughout the land to the tune of millions of pounds. You need to educate yourself about the dangers posed by condensation to your family’s health so you can understand what’s at stake. Read the information below so you can have a clear idea of what condensation is, how it can harm your family, and what you can do to proactively deal with this silent and invisible threat. Condensation is the process of water droplet formation when warm air meets cold air. For most homes in the Northern Hemisphere, condensation occurs most frequently during the winter. When it’s cold outside, families would heat up interior living spaces and this creates a massive pocket of hot air inside the house. As people breathe, cook, wash dishes, do laundry, or otherwise engage in activities involving water, they end up releasing moisture into the air. This water-bearing air turns into water droplets as warm air in the home sinks to become cooler air. Given enough chilling by colder parts of the home (due to the frigid air outside the house), the warm air condenses out to produce water droplets on walls, window surfaces, or other flat areas in an area where the warm moisture-bearing air meets up with cold air. Why is home condensation a problem? Unsightly mould – caused by poor airflow and condensation. Condensation would not pose health risks if the warm air in your home condenses on flat surfaces that quickly dry out. Whatever water droplets that may form quickly evaporate. Unfortunately, there are some parts of your home that are cool enough to retain moisture. These panels and areas become wetter and wetter due to the collision of hot and cold air in your home. These wet and dark areas may remain wet enough for a long enough period of time for mould to form. Mould is a constant threat because there are almost always trace amounts of mould spores in the air. Given enough water, these latch on to flat surfaces in dark hard to reach areas like the back of home appliances like refrigerators and washers and dryers. 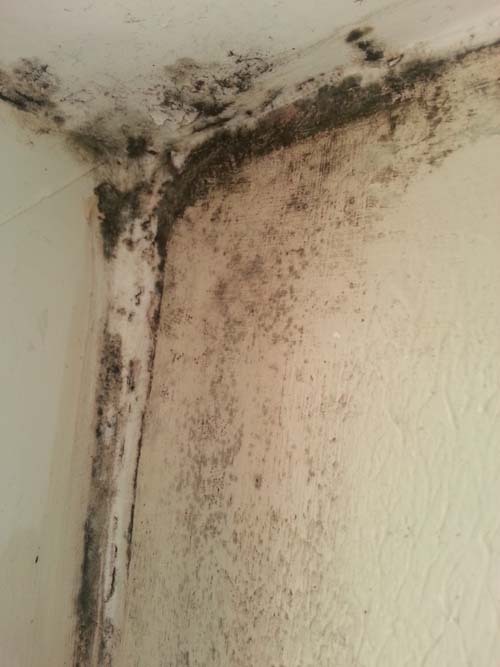 These mould colonies then start to grow and cover larger and larger areas. What’s the big deal about home mould infestations? In addition to the fact that mould may be growing in areas you’re not readily aware of-like the top side of your ceiling tiles-they can be very unsightly. Splotches may appear on your walls and ceilings. Replacing these can set you back more than a few pounds in painting and finishing costs. In fact, they can seriously compromise the integrity of wall or ceiling plasterboard if you neglect them long enough. These boards can get very brittle and crack easily. Plus, they are nasty eyesores. More troubling than the cosmetic hassles of mould damage is mould’s health risks. When mould colonies form, pile up, and dry out, they can form dust-like clusters. If the surface these clusters get disturbed, the resulting release of fine mould dust can easily be absorbed by the lungs. Unlike larger dust particles your respiratory tract can filter, block, and detect, you can’t simply sneeze out fine mould dust. Indeed, they act similar to asbestos in reaching deep parts of your lungs and this can lead to chronic bronchial or pulmonary conditions. You have to be very careful when disturbing panels or knocking on walls. You might be releasing fine mouldy dust into your home’s interior air and breathing this mould in without knowing it. This invisibility is what makes fine mould dust particularly dangerous. The solutions described below are not listed in order of importance or priority because every home is different. Just start with the solution that is most appropriate to your situation and later explore the other solutions listed. By simply reducing the amount of moisture in your home, you can go a long way in making your home’s condensation issues go away once and for all. With little air moisture, there’s less chance water droplets will form around your home. With reduced water availability, mould might have a tougher time growing. You can easily and quickly reduce moisture by installing moisture extractor fans in your bathrooms and kitchens. Extractors dry out your interior air quickly and efficiently. But, they can be expensive or impractical to install. If an extractor is not right for your home you may want to try using a dehumidifier. Extra tip: It’s a good idea to close the doors leading to your kitchen or bathrooms while running extractor fans or dehumidifiers to increase their effectiveness. Install trickle vents on your windows so any water that manages to build up will be quickly redirected so they drain out instead of accumulating in puddles. This vent system takes your moisture rich interior stale air and pumps it outside. The system then pumps in fresh, cooler air which it heats up so it matches the interior temperature of your home. Solution #4: Open your windows! During the warmer times of the year something as simple as opening your windows whilst showering or cooking allows the moisture you produce to quickly escape, preventing it condensing on windows or walls so easily. With proper insulation, the temperature of the air inside your home remains higher than its dew point (the temperature in which moisture in the air turns into water droplets). This higher temperature level prevents water formation. You can put insulation in the wall panels or ceilings of the areas of your home that tend to get wet from condensation. Condensation is a serious threat to your home’s aesthetics, your health, and your pocket. Keep the five solutions above in mind when dealing with condensation. With proper planning condensation prevention doesn’t have to cost a lot of money or time.